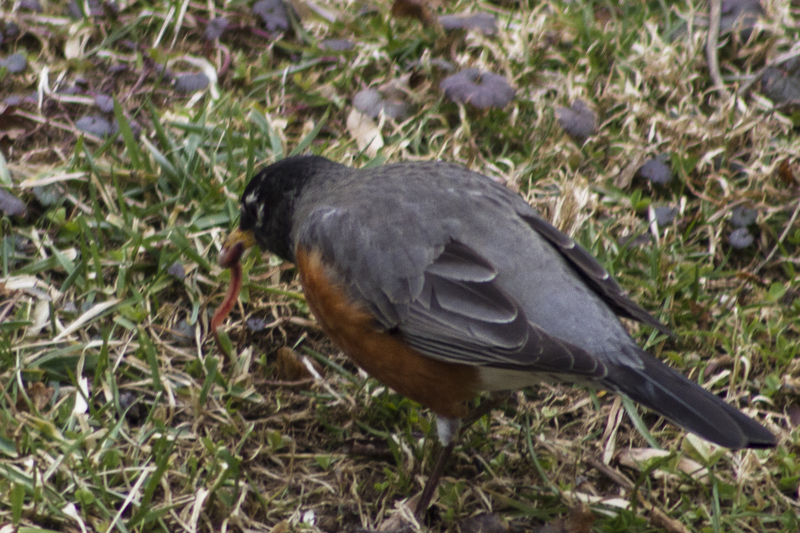 I knew spring wouldn’t be too far behind when on February 10th a bunch of robins showed up in our garden, acting like they had never left, but the very next day we got a blast of cold weather here in the Mid-Atlantic region of the US and the robins disappeared. Where to, I have no clue, because they go somewhere during the worst of winter. Fast forward a couple of weeks and the temperature reached into the 60’s and sure enough, robins came back in force. They have been busy in the garden and getting ready for me when I tilt the soil for my vegetable garden and making their job of getting worms a piece of cake. So, YES! Spring is here! But wait! Oh nooooo! We are getting one more snowfall tonight that promises 4 – 8 inches by the time it is all done so I think the robins and I jumped the gun by at least a week ahead of mother nature. But this one robin in the picture above got its meal today, and there are a lot more worms waiting where that one came from.